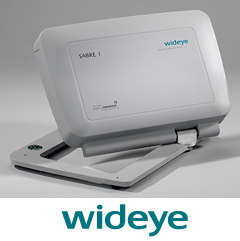 The Wideye SABRE I BGAN satellite data terminal combines a compact design with performance and optimal flexibility. It is equipped with a range of common interfaces, providing connectivity options in the field and the swivelled antenna facilitates rapid and easy pointing for a satellite connection. Combined with its sub-laptop size, the terminal is ideal for single users who need to set up a complete broadband mobile office in frequently changing locations.